The island and abbey of Mont-Saint-Michel is one of the most visited, most photographed, and most easily recognised landmarks in France. It is in a large bay at the southern end of the Cotentin peninsula in the Normandy region of France, close to the border with Brittany. Mont-Saint-Michel is one of the leading tourist destinations in France as well as an important pilgrimage destination, with more than two million visitors each year. An interesting fact: only one in three of these visitors actually make it as far as going in to the Abbey that is on top of the Mount! When you first arrive the sight of Mont-Saint-Michel from across the water is really amazing, just as impressive as you expect despite the hundreds of times you have seen photographs of the island...but once I got to the island I must admit to a tinge of disappointment: I was expecting a kind of medieval town perhaps like Carcassone on an island but in fact the Abbey takes up most of the island. 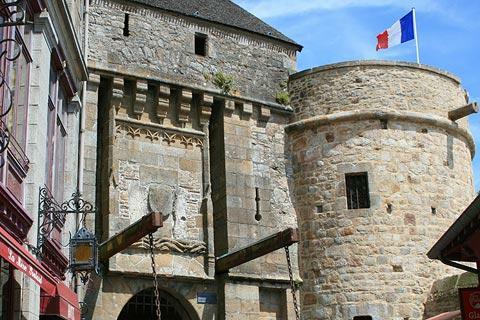 Your first port of call will be the Mont-Saint-Michel tourist office, situated just as you enter the island and in an impressive historic building called the Burgher's Guardroom. 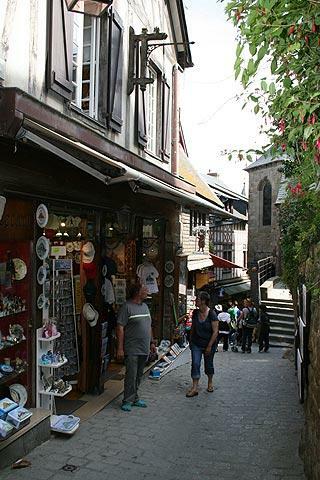 From here you can pass through the ancient gateway to reach the Grande Rue. This short road to the abbey is full of attractive buildings, mostly from the 15th and 16th century, but these in turn are full of tourist rubbish and absolutely heaving with people. 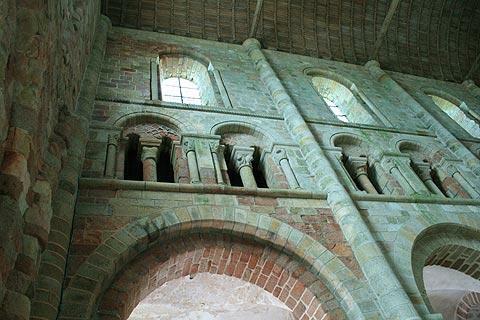 Keep looking at the upper stories of the buildings however and you will see some lovely medieval architecture. You can also see the small 15th century Church of Saint-Peter in this part of the town. At the end of this street you reach the grand staircase that leads to the abbey. 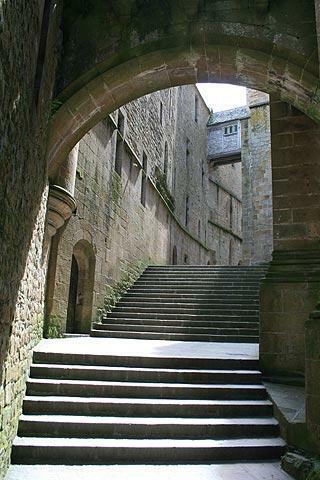 It really is not worth going to Mont-Saint-Michel unless you are going to enter the abbey. 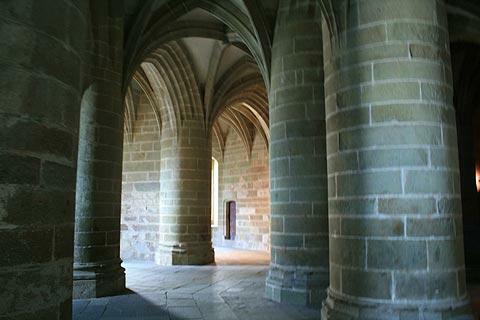 The Abbey is superb, it is vast and some of the rooms such as the ‘Great pillared crypt’ are fantastic. 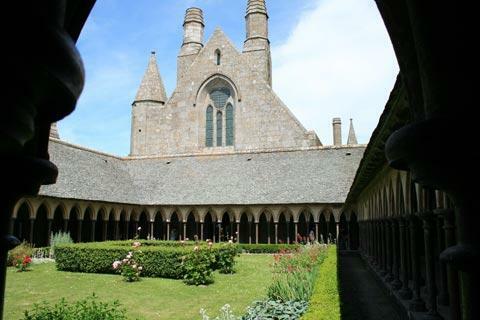 The cloister too is very beautiful. The views from the top are also splendid. The abbey which is mostly gothic in style is known as 'La Merveille' or 'the Marvel‘. It was built over the course of many years, from the 11th to the 16th centuries, so you can actually see both romanesque and gothic style elements of architecture. 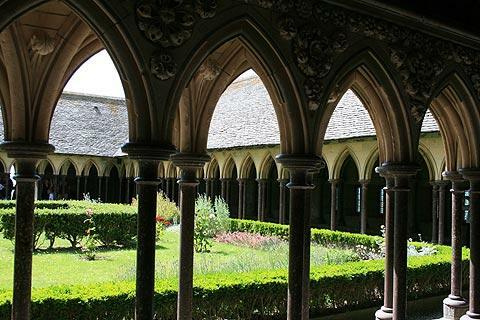 Some of the buildings around the Abbey of Mont-Saint-Michel are reserved for the Monastic Brotherhood of Jerusalem who ensure that prayers are continually being said in the abbey. 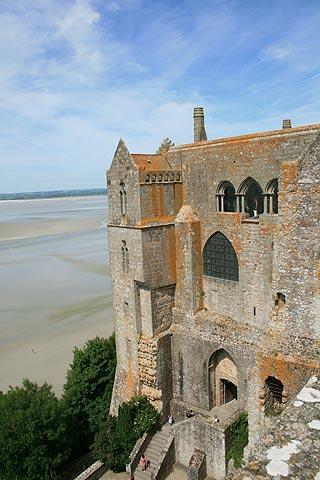 After your visit to the abbey you can enjoy very far-reaching views across the bay. 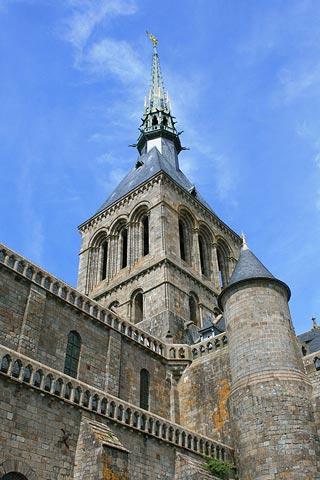 For a long time ownership of Mont-Saint-Michel alternated between Normandy and Brittany. Because it lies at the mouth of the river that separates the two regions, and the river kept silting up and changing direction, Mont-Saint-Michel also regularly moved between the two French regions. Brittany still make the (not unreasonable) claim that since the island was originally theirs, it is hardly their fault if the river has moved, so it should still be theirs. Normandy don't agree! 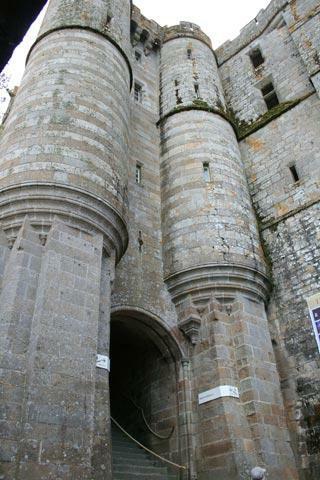 For a spell of its history Mont St Michel was a prison but by 1836 a campaign was launched to restore it as a national treasure. Victor Hugo was one of the campaigners. 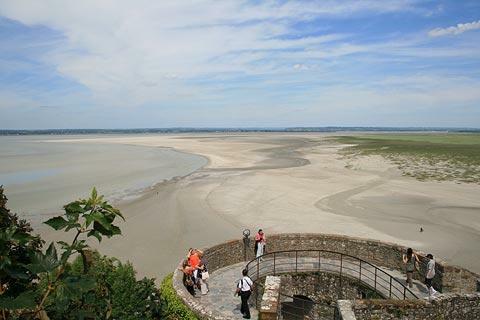 The prison was closed in 1863 and Mont St Michel was declared a national monument in 1874. 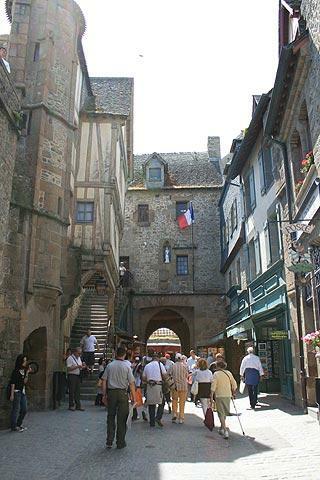 Mont Saint Michel is also listed as a UNESCO World Heritage Site. 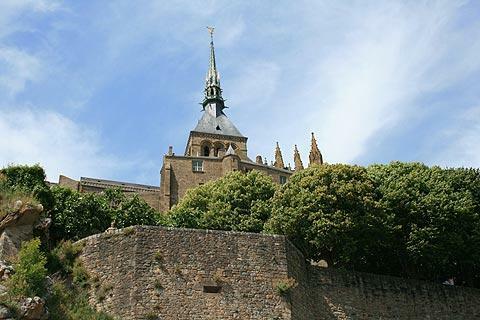 Of course, Mont-Saint-Michel is the most famous monument here but there are plenty of other towns and villages nearby that you will want to visit when you are in the region. Our favourites include the coastal path and a lunch of oysters at Cancale, exploring the historic centres of both Dinard and Saint-Malo, and travelling south to explore the historic town and castle at Antrain.